Fatima Benbrahim: my historical assistant, who has not spared herself in all these years and, without whom, all I have done in Marrakech would not have been possible. Unique and precious. Nezha Boufsi: surveyor and site technician, he has been for many year a stalwart of the construction business. His seriousness and expertise have always been vital (I remember with pleasure how we chose the beautiful colour green of the Spa together). Abderzak Taoussi: site foreman and director of works, we have built many Riads together. He has always stood out for his infinite professionalism, seriousness and knowledge of his profession. A friend. Abderrahim Boukricha: I have never found anyone more competent that Aberrahim in the ted lakt process, an ancient, very complicated technique of finishing walls. Patient, always alert and attentive to his team. Claudio Di Giusto: he has been the company's designer for many years, very reserved and serious but equally precise and swift in ably and carefully overseeing all the work phases, perfectly anticipating and correcting the designs during the work. Stefano Tardito: architect, engaged on the Riad Nashira during the final months of work, he took part in the finishing of the rooms and the design of the furnishings with sublime results from a strong, coherent personality. Mehjoub and Hassan: brothers, great help for more than ten years, always there for any work and always in a good mood. Aziz, Abderrahmane, Nordinne, Houma, Rachid, Mohamed, Youssef, Said, Abdellatif, Hicham ... and many more: we still work with some, but everyone we have shared years of work with stand out for their seriousness, respect and kindness … “people with good hearts”. 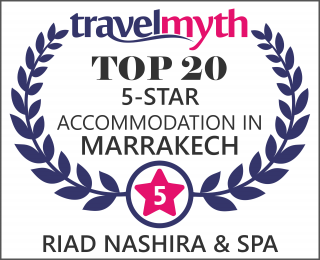 The most important thanks go to the clients, who have sought us out and shared time, making the Riad Nashira a lively, stimulating and pleasurable place.